With the shrinking public purse, the need for educational providers (colleges and universities) to generate revenue from commercial activity has never been more acute. Establishing an Innovation Hub provides a structured and cost effective platform that enables an educational provider (colleges and universities) to generate commercial revenue, strengthen outreach activities and enriches the educational offer. It offers a swift and efficient route to business development and income generation opportunities. We work closely with you through this journey, providing you with clear guidance for the Hub’s management, helping you develop your active innovation plan for growth and launching your Hub successfully in record time. The net impact is greater economic value and social benefit through more customers, diversified markets, better asset utilisation, enriched STEM curriculum and strengthened partnerships. All of which enable you to develop new sustainable revenue streams that underpin your college plan for growth. Education and training providers including colleges, universities and other knowledge-based organisations engaged in economic development activities. Create the New Offer- apply tools and techniques for ideation, validation and selection to create new offerings that aligns with your strengths, USPs and strategic business direction. 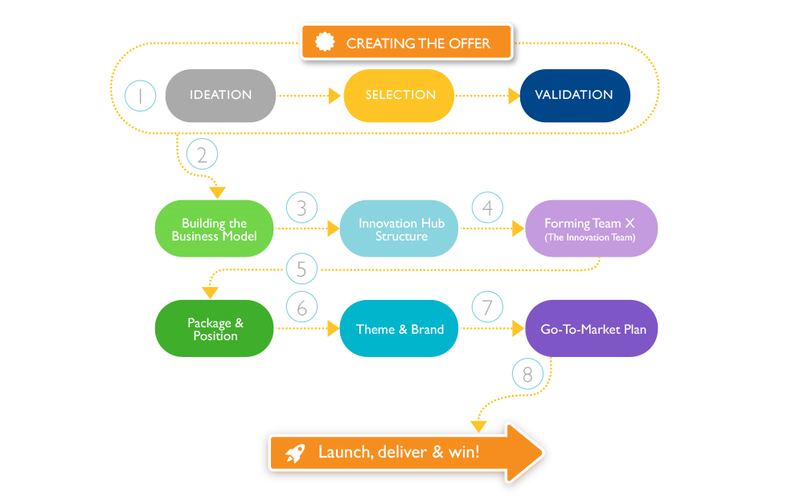 Build the Business Model - develop the business case that could become potential products and services to be offered through the Innovation Hub using a 10-steps canvas. Develop the Innovation Hub Structure - present possible implementation plans for the hub including structure, processes, services, engagement and governance. Form Team X - identify who is needed in Team –X, examine the characteristics of innovative people, define a set of guiding principles to enable innovation development, build an action plan road-map and define the roles and responsibilities for implementation. Define the go-to-market plan - understand ‘how to’ position your Innovation Hub competitively, identify key target markets, establish pricing and revenue model, theme and position your services, define the brand identity and communication strategy for the Hub, and go forthwith and win! Successful Innovation Hubs can also apply for the Investor in Innovations standard and award.